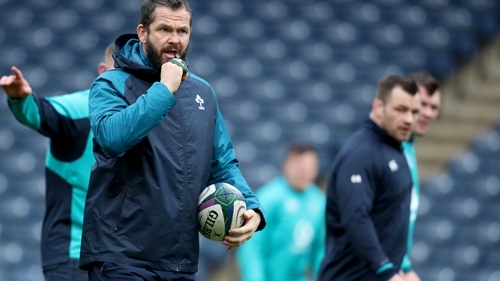 Andy Farrell's first game in charge of Ireland will be against Scotland next February, it has been confirmed. The current Ireland defence coach takes over from Joe Schmidt after the World Cup in October. The Six Nations today announced the fixture list for the next two seasons and Farrell's reign will start at home to the Scots on Saturday, 1 February 2020. Scotland are also in Ireland's World Cup pool. That will be followed up with another Dublin tie against Wales the week after with Ireland then getting a two-week break to prepare for a Sunday afternoon clash with England at Twickenham on 23 February. Ireland, who finished third in this year's tournament, face Italy in the Aviva on 7 March before rounding off their campaign with a trip to France for an 8pm kick-off in the final match of the Six Nations. The fixture list for 2021 has also been confirmed with Ireland starting with a trip to 2019 champions Wales on Sunday 7 February before a home game against France. Round three involves a trip to Rome, while Murrayfield will be the venue for the second last game before a home finale against England on Saturday 20 March, the middle game of Super Saturday.